Just another brief post to say a couple of things...first of all, has everyone seen my new layout? Isn't it amazing? It was done for me by the incredibly talented Kate Gabrielle who has her own blog (you can find a lot more links of where she's at on the internet there) and makes wonderful art, too. If you like her work, you can get her to do your layout via her etsy store. Secondly, I've finally finished all of my assignments (for this semester, at least) so that means I should have more time to blog. Hurrah! If I can think of what to blog about, that is - I haven't been taking many outfit photos lately so hopefully I get back into that, at least. And for those of you who actually enjoy these, a couple of new-ish ukulele videos! Adding to the zillions of versions of Fly Me to the Moon. Cover of The Rat by The Walkmen. This isn't a vintage song but I've played it in an entirely different way than the original. Hope everyone has had a great weekend and I hope it won't be too long before you see another post from me! Oh my gosh the layout is AWESOME. Love love love it! Omg- I love the new look! I'm wanting to do the same and don't know whether I should tackle it..bt the pic of you is amazing!! Hey!! I love your videos, you play the ukulele & sing wonderful! Your new layout is amazing!! P.S. Congrats to finishing all your assignments for the semester!! 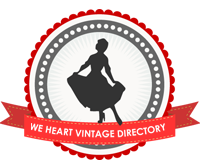 I am a follower of your blog, I adore vintage!! Ms. Dee: =D Thanks. I love it. kate: Thank-you! I'm happy to hear that. And I'm glad you're glad. Haha. I love your new layout, very neat. so lovely to meet fellow Aussies :) and such a lovely blog. I went back a bit but couldn't find the answer to this question: what you are studying?